Gardeners and landscapers may want to rethink their fall tree plantings. Warming temperatures have already made the U.S. Department of Agriculture’s new cold-weather planting guidelines obsolete, according to Dr. Nir Krakauer, assistant professor of civil engineering in The City College of New York’s Grove School of Engineering. 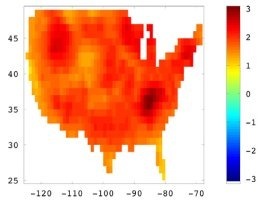 Professor Krakauer developed a new method to map cold-weather zones in the United States that takes rapidly rising temperatures into account. Analyzing recent weather data, he overhauled the Department of Agriculture’s latest plant zone map released in January. 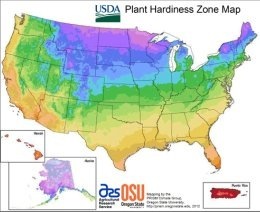 The new USDA Plant Hardiness Zone Map, which predicts which trees and perennials can survive the winter in a given region, was a long time coming. Temperature boundaries shown in the latest version have shifted northward since the last one appeared in 1990. But the true zones have moved even further, according to Professor Krakauer’s calculations. This means that fig trees, once challenged by frosty temperatures above North Carolina, are already weathering New York City winters thanks to changing temperatures and the insulating effect of the metropolis. Camellias, once happiest south of Ohio, may now be able to shrug off Detroit winters. Professor Krakauer found a weakness in how the agency came up with the zones, however. The USDA averaged annual minimum temperatures over a 30-year span, from 1976 to 2005, but winters have warmed significantly over that period. Zones now average about 2 degrees Fahrenheit warmer than the USDA’s 30-year average. “What is happening is that the winter is warming faster than the summer. Since [my] hardiness temperatures are based on minimum temperatures each year, they are changing faster than the average temperatures,” Professor Krakauer said. He found that these lowest yearly temperatures warmed roughly two and a half times faster than the average temperatures. His analysis also showed that the country is changing unevenly; more warming is occurring over the eastern interior and less in the Southwest. He noted that similar analyses could distinguish long-lasting climate trends – in wind or rainfall, for example – from year-to-year weather variations to distinguish between what some are calling the recent “weird weather" and the natural variations in global weather. The National Oceanic and Atmospheric Administration (NOAA) supported this study. Professor Krakauer studies the Earth's water and carbon cycles at the Grove School of Engineering at The City College of New York, particularly the effects of global warming and other human impacts.